Arianespace has successfully launched four more satellites in the Galileo constellation. Liftoff was at 8:25 a.m. (local time) July 25, 2018 from the Guiana Space Center, Europe’s Spaceport in Kourou, French Guiana. Today’s launch was the 99th mission by the Ariane 5 heavy launcher. It was carried out on behalf of the European Commission as part of a contract with the European Space Agency (ESA). It also was the last in a series of three launches for Galileo using the version of Ariane 5 with a storable propellant upper stage (ES). Two additional missions to deploy four more satellites have been assigned to the A62 version of the upcoming Ariane 6 launch vehicle. Today’s emblematic launch also was a landmark for the European space sector. Taking place at Europe’s Spaceport in French Guiana, it brought together, in addition to the ESA Director General and the heads of national space agencies, Elżbieta Bieńkowska, the European Commissioner for Internal Market, Industry, Entrepreneurship and SMEs (DG GROW); Frédérique Vidal, the French Minister of Higher Education, Research and Innovation; Sébastien Lecornu, the French Minister of State, attached to the Ministre d’Etat, Minister for the Ecological and Inclusive Transition; and Pedro Duque, the Spanish Minister for Science, Innovation and Universities. Galileo is Europe’s own global navigation satellite system. The complete Galileo system will comprise a total of 24 operational satellites, along with six spares. Since December 2016, Galileo has offered guaranteed and high-precision positioning services under civilian control. These services already are used by more than 100 million commercial devices. Today’s flight, VA244, the third and last performed with the Ariane 5 ES launcher dedicated to Galileo missions, orbited the constellation’s satellites 23 to 26, built by OHB System. Arianespace has now deployed a total of 26 satellites for the constellation. Two additional missions, to orbit four more satellites, already have been assigned to the A62 version of the new Ariane 6 launcher. Arianespace guarantees independent access to space for Europe through its complete family of launch vehicles. Working for flagship programs by the European Commission and ESA, Arianespace already has deployed all Galileo satellites launched to date, and carried out four missions for Europe’s vast Earth observation program, Copernicus. 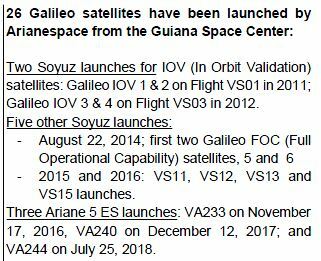 Following the success of this latest Galileo mission from the Guiana Space Center, witnessed by key players in the European space community, Arianespace will carry out three more missions for European institutions in 2018. 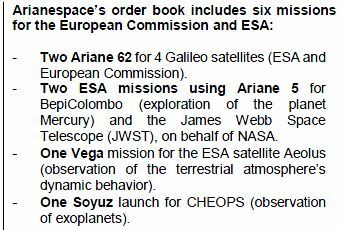 Two emblematic missions are coming up for ESA: the August 21 Vega launch of a wind study satellite called Aeolus; and then on October 18, an Ariane 5 launch of the BepiColombo spacecraft to explore the planet Mercury (in partnership with the Japanese space agency JAXA). A Soyuz medium launcher will then loft EUMETSAT’s meteorological satellite, MetOp-C. Following the European Commission’s announcement of an ambitious space budget proposal for the coming decade, and the ESA Council’s confirmation in June of funding for the transition period between Ariane 5 and Ariane 6, Arianespace confirms the availability of its future launchers – Ariane 6 and Vega C – to carry out governmental missions for the European Commission, ESA, EUMETSAT and European countries. Stéphane Israël, Chief Executive Officer of Arianespace, emphasized: “With this fourth launch of the year, and the third with Ariane 5, Arianespace has proudly accomplished its 10th mission for the Galileo program. Today’s mission brings the number of satellites launched by Arianespace for this European constellation to 26 since 2011. I would like to thank the European Commission, and in particular DG GROW, as well as the European Space Agency, for their continued trust. More than ever, Arianespace confirms its assigned mission of guaranteeing independent and reliable access to space for Europe. We are especially pleased that the next two Galileo missions have already been assigned to the A62 version of our new Ariane 6 launch vehicle. Furthermore, we are honored to have had, alongside ESA’s Director General, the President of DLR Group and the presidents of CNES and ASI, the highest political authorities in charge of space, attend this launch. I would like to thank Commissioner Elżbieta Bieńkowska, the French Minister Frédérique Vidal and the Spanish Minister Pedro Duque for experiencing this achievement with us at Europe’s Spaceport.” Thanks also to French Minister Sébastien Lecornu for his presence: the environment is at the heart of our activities and preoccupations. The Galileo FOC-M8 23, 24, 25 and 26 satellites were built by OHB System AG in Bremen; with the payloads supplied by the UK-based SSTL (Surrey Satellite Technology Ltd), 99% owned by Airbus Defence and Space. The satellites’ average mass was 716 kg. each, with the combined payload lift performance for the mission of 3,284 kg. – which included the 418.5-kg. payload dispenser. These satellites were placed into a circular medium Earth orbit (MEO) in Plane B at an altitude of 29,600 km. and an inclination of 56.31°.